AP Police Constables,Warders Hall tickets, Results 2017: AP Police Constables,Warders Written Test Preliminary Key & Question Paper. 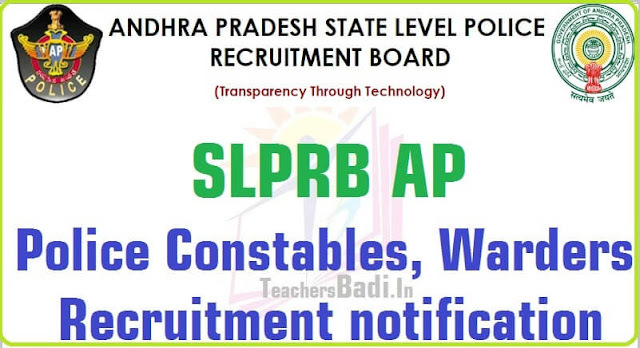 #SLPRB, AP Police #Constables, #Warders Recruitment, Online application Form, last date for apply, Selection Procedure, Preliminary written test, Physical Measurement Test, Physical Measurement test, Exam date, Hall Tickets, Final Written Exam and results details given here and also @ http://recruitment.appolice.gov.in/. PC (Civil&AR), Warder(Prisons), PC Communications: AP State Level Police Recruitment Board(SLPRB, AP) has published the Police Constables(Civil, AR), Warders recruitment notification and APSLPRB invites application through ONLINE mode only in the prescribed proforma to be made available on WEBSITE (recruitment.appolice.gov.in) from 03-08-2016 to 14-09-2016 for the following posts. The number of vacancies indicated is only provisional and is liable for change without giving any notice. SLPRB, A.P., reserves the right to notify the modifications with regard to any aspect of recruitment during the process of recruitment. SCT Police Constables(Communications) Dt: 27/08/2016: SLPRB, A.P. invites application through ONLINE mode from 07-09-2016 at 1000 hours to 01-10-2016 at 1700 hours for the Stipendiary Cadet Trainee Police Constables (Communications) posts. The Physical Measurement Test and Physical Efficiency Test is likely to be held in the first week of October, 2016. The Final Written Examination is likely to be held in the first week of November, 2016. The candidate must hold, as on 1st July, 2016, Intermediate or its equivalent examination recognised by the State Government. In the case of a candidate belonging to Scheduled Castes or Scheduled Tribes, as on 1st July, 2016, he/ she must have passed SSC or its equivalent examination recognised by the State Government and should have studied Intermediate and appeared for the Intermediate Examinations in both the 1st year and 2nd year. (i) A person who is a local to Andhra Pradesh State and also working in Andhra Pradesh Police Department as on the date of notification, has been on duty as Home Guard for a minimum duration of 360 days within a period of two years and who is still continuing his service as Home Guard, must have attained the age of 18 years and must not have attained the age of 32 years as on 1st July, 2016 i.e., must have been born not earlier than 2nd July, 1984 and not later than 1st July, 1998.
b) Chest: Must not be less than 86.3 cms round the chest on full inspiration with a minimum expansion of 5 cms. a) Height: Must not be less than 168 cms. a) Height: Must not be less than 162 cms. inspiration with a minimum expansion of 4 cms. ii) Each eye must have a full field of vision. eye shall be deemed to be a disqualification. b) The candidate should possess sound health and be free from any bodily defect or infirmity which will render him unfit. NOTE : In order to prevent disappointment, candidates are advised to have themselves examined by a Civil Surgeon before applying for the examination to ensure that they meet the prescribed Physical and Medical Standards. A prescribed fee for OCs/BCs is Rs. 300/- (Rupees three hundred only) and for SCs/STs is Rs. 150/- (One Hundred Fifty only) towards Applications Processing and Examination. A) Preliminary Written Test: Candidates shall be required to appear for the Preliminary Written Test in one paper (three hours duration) for 200 marks (200 Questions). The syllabus for Preliminary Written Test is given in Annexure-II (enclosed). Intimation Letter: The candidates who qualifies in the Preliminary Written Test will be informed the dates for downloading the Intimation letter through the website recruitment.appolice.gov.in for appearing in the Physical Measurements Test (PMT)/ Physical Efficiency Test (PET) with details of Venue, Date and Time. B) Physical Measurements Test (PMT): The candidate who qualifies in the Preliminary Written Test will be called for Physical Measurements Test. The Physical Standards are mentioned at para-12 above. 05 1600 meters run 8 Mintues 9 Mintues 30 Sec. Seconds 10 Mintues 30 Sec. All candidates declared qualified as above shall be required to attend 1600 Meters run (1 Mile Run) which is qualifying. Candidates who qualify in the above shall be required to appear for the final written examination in one paper (three hours duration) for 200 marks. The syllabus is given in Annexure-II (enclosed). Candidates who qualify in the above shall be required to appear for the final written examination in one paper (three hours duration) for 100 marks (200 questions). The syllabus is given in Annexure II (enclosed). Candidates who qualify in the above Physical Measurements Test and Physical Efficiency Test shall be required to appear for a final written examination in one paper (three hours duration) as given below. The Physical Measurement Test and Physical Efficiency Test is likely to be held in the first week of October, 2016. The Final Written Examination is likely to be held in the first week of November, 2016. The PMT, PET & Verification of Certificates was conducted for Constable,Warder posts and the result was declared. The Final Written Examination for the said posts will be held on 22.01.2017. The List of candidates who qualified in PMT & PET for the Police Constables, Warders are eligible to appear in Final Written Examination. State Level Police Recruitment Board, Andhra Pradesh, Hyderabad. Rc.No.202/R&T/Rect.2/2016 Date:22 -01-2017: Recruitment to the posts of SCT Police Constable (Civil) (Men & Women)-3216 Posts, SCT Police Constable (AR) (Men & Women)- 1067 Posts, in Police Department and Warders (Male)-240 Posts & Warders (Female)- 25 Posts, in Prisons & Correctional Services Department was notified vide Notification Rc.No.202/R&T/Rect.2/2016, dt: 22-07-2016. 2. The Final Written Examination was held on 22-01-2017 in 5 locations i.e., Visakhapatnam, Rajamahendravaramu, Vijayawada, Tirupati and Kurnool. 3. 72,324 Hall tickets were issued. 72045 candidates were attended for Final Written Examination. 279 Candidates were absent. 99.61% of candidates appeared for Final Written Examination. 4. Answer Key for Question Booklet Series-A,B,C &D will be uploaded on the website (recruitment.appolice.gov.in) today i.e., on 22-01-2017. Candidates may download the answer key. candidate should submit the objections in the following format only will be considered. 6. The results of the Final Written Examination for the said Posts will be announced within a fortnight. 7. The entire process was conducted peacefully. 6. The results of the Final Written Examination for the said Posts will be announced within a fortnight. The entire process was conducted peacefully. Recruitment to the posts of SCT Police Constable (Civil) (Men & Women)- 3216 Posts, SCT Police Constable (AR) (Men & Women)- 1067 Posts, in Police Department and Warders (Male)- 240 Posts & Warders (Female)-25 Posts, in Prisons & Correctional Services Department was notified vide Notification Rc. No. 202/R&T/Rect.2/2016, dt: 22.07.2016.